Boss: End of Act 1. End of Act 2 (Sonic/Tails only). Music: Act 1 has a very lively, catchy tune to it that culminates into a melodic and dramatic climax. Like the level design in general, Act 2 prefers a very different take that's much more subtle, consisting of a similar underlying rhythm, but with an almost completely different tune on top of it. 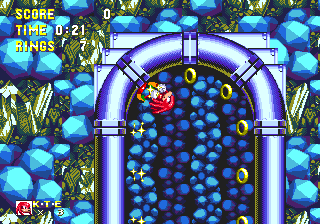 With longer, higher notes, the proximity to the mysterious and majestic Master Emerald is emphasised well through the icy music. Act 1: 4 minutes - 5 minutes (Sonic/Tails). 3 minutes, 30 seconds - 4 minutes, 30 seconds (Knuckles). Act 2: 5 minutes - 6 minutes, 30 seconds (Sonic/Tails). 3 minutes - 4 minutes (Knuckles). - Fire shield, fire shield, fire shield. An obviously desirable item here, so make sure you keep your eyes peeled whenever you find yourself without one. And don't think that this isn't as important in Act 2 just because it's icy - there's sure to be a lick of flame round every corner despite this. A lightning shield is also a useful alternative, as this will at least protect you from the exploding badniks that are constantly appearing from underneath rocks. 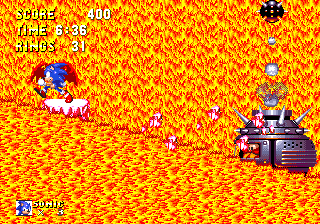 - Both the foreground lava-falls in Act 1 and the flailing fire torches in Act 2 are notorious for leaving only very short gaps between their respective bursts of activity. If you don't have the fire shield recommended above, make sure you understand their patterns before taking risks where they're involved. 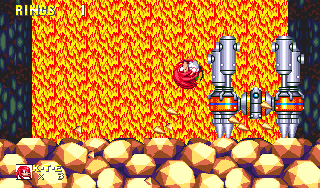 - The wide, spiked crushers in Act 1 are a bit frightening, especially when they're in small corridors and only go up a very small distance before crashing down again. In this case, their added length makes them seem like a more prominent threat than similar crushers in other levels, but don't treat them differently. Just spin dash along underneath as soon as it moves high enough out of the way, and you'll be fine. This is probably easier than trying to run across the flat bit on their tops. Knuckles has to deal with this tricky configuration more often than Sonic does. - Toxomisters, the immobile, cycloptic pole badniks sticking out of the ground may look a bit pointless but they're deceptively deadly in tight spots, when combined with other obstacles. Should you catch the cloud of gas that they release, it'll dramatically restrict your movement and more to the point, deduct one ring per second from your tally as it follows you around. A spin dash is all it takes to escape, but should you accidentally get hit by something else while under the cloud, suddenly there'll be no more rings for it to deduct, and you'll be dead in less than a second from that point. Be very cautious. - This is the last level in which Special Stage rings appear, so if you're behind on your emerald collecting, you'll want to take advantage of the several big rings distributed around the level. If you're Knuckles, make sure you look into the secret option to join Sonic's route as a detour around Act 1, discussed in Point #1, as this is where you'll have a chance to grab a couple of otherwise inaccessible ones. You should probably add the fact that there are 3 unused ring rooms in Act 1. I always thought Act 2 was an ice level like Ice Cap Zone but after playing through it recently it dawned on me that the "ice" is actually just crystals. 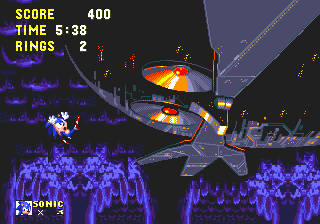 I was really hoping that there was some secret way for Sonic or Knuckles to reach the Tails only giant ring in Act 1 but it looks like it really is Tails only. 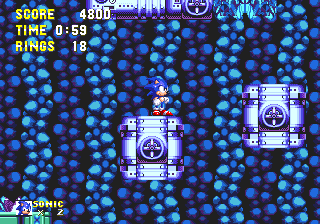 Sonic and Knuckles can easily reach it with debug mode. Waiting for Sky Sanctuary zone map. You can even skip Hidden Palace. Thanks. Heres a intresting glitch. 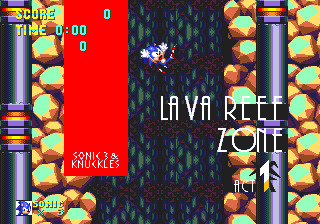 If you are super sonic or hyper sonic, you can get to the knuckles only section of Lava reef Act 1. To do this, you need to be super sonic or hyper sonic. 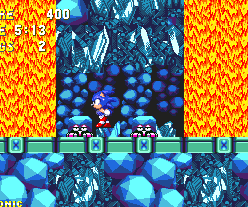 Just after the first unused ring room, go down transform into super or hyper sonic go right then go left and double jump and you will go trough the rock barrier into the knuckles only section of lava reef act 1. Genius!!! In lava reef act 2, the final special stage is quiet hard to find. I didnt realse it was there! 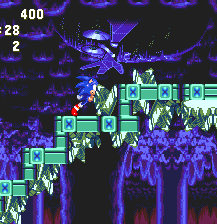 -Remembering this is the last level in the game you have Access to Special Stage rings, So The earliest shortcut for the Sonic/Tails route (going up after the three horizontally shifting floating blocks) will cause you to miss out on 2 Special Stage rings, to ensure you still have access to them you must go right here, not up. *Going up once you reach the giant metal spinning cylinder with the spikes and the ladder, will cause you to reach an immediate new linear pathway with no return, and miss your chance to recover the (2) special rings, although providing a fairly decent yet challenging shortcut. 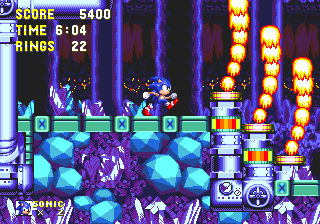 *Additionally, if you manage to access the first special ring again, go directly down and back to the left then down the breakable blocks and right (ie. not up, another impassable cut-off point will occur if you do) if it is your intention to aquire the second special ring. And it has to be said; the music for this level is just brilliant, to create such a lovely ancient, elegant and mysterious atmosphere and such a brilliant contrast and to it's upbeat counterpart, whats more is that this stage in tandem with hidden palace zone go hand in hand to shift the atmosphere of the (only?) plot development and does so wonderfully on point. Certainly one of the more under appreciated compositions, perhaps because it such a masterful plot peice is the reason this song breathes life almost exclusively during playthrough unalike more well known and referenced tunes such as "Green Hill", "Chemical Plant", "Ice Cap", etc. Despite being every bit as deserving of such recognition, in it's own way at least. 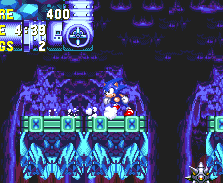 A glitch does exist in the boss zone whereby you can fall and land on the right hand platform and gain an extra life, regardless of the existing ring count! 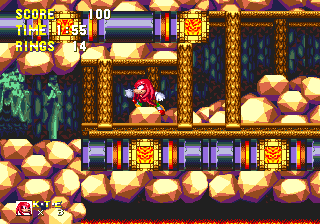 Sonic drops down in cave after Sandropolis Zone Boss, and Knuckles dont drop. Why in Lava Reef Sonics way is higher, than Knuckless way? Iwamodoki translates to Rock revival. I thought some people would like to know. Spacious areas inside the subterranean volcanic caves of Act 1 are supported by massive thick rocky pillars with a green-ish glow, reaching up from the floor to the ceiling in the background, with stalagmites and stalactites surrounding their bases on either end. Beyond, there are veins of bright lava streaming between black rocks, and other endless glowing pillars into the distant abyss of the colossal caverns. 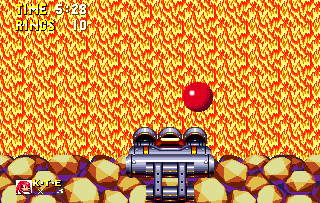 Look for Robotnik's Death Egg facing downwards in a hole in the ceiling some distance away, with red flashing eyes. The rough, molten foreground surfaces of Act 1 are based mostly on rounded light brown rocks, almost polygonal in appearance, and stacked on top of each other. 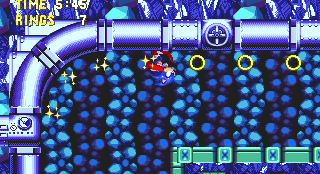 Their darkened areas shift from black to glowing purple regularly, and among them you'll also find a grid network of thick, purple pipes running throughout the act, with various connecting features such as valves and flashing patterns. 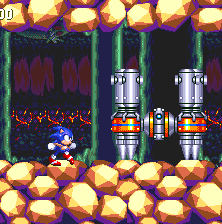 Though thoroughly integrated into the rock, their purpose and origin isn't clear, but presumably they have been placed by Eggman, along with the other man-made traps and features in the level, perhaps to aid and defend the Death Egg's regeneration once again. Steep slopes are tamed by a series of square wooden block steps, and narrow tunnels are supported by wooden beams reaching horizontally and vertically. Short thin bronze poles flank either side of some pathways with little red and yellow decorative flashing patterns on their tops. Though pits of lava and tumbling "lava-falls" are obvious hazards, some lava also falls harmlessly in vast, wide streams just behind the character. The many internal tunnels have a dark, dull green crystalised pattern to them that fades gently in colour. Lava Reef is a level of opposite extremes, and when you enter Act 2 you'll see exactly why, as the environment magically changes from violent and active to a calmer, blue world of ice and crystals. 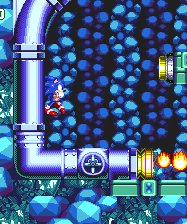 It's unfortunate that the reasons and stories behind so many of these old levels are never officially clarified, but I like to think in this case that it's the Master Emerald that keeps these hot and cold environments in such close co-existence. 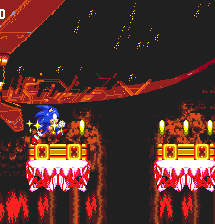 The background of Act 2, in the few areas that actually break away from the internal tunnels, is almost exactly the same as Act 1, though with a purple glow to the mighty pillars as opposed to a green one. Towards the end, the perched Death Egg appears much bigger, peering in through the rocky ceiling. The foreground is partly blue-ish rounded rock, similar to the brown ones in Act 1, and partly sparkling crystals that glow from one colour to another. The disorganised rubble is overlayed this time by thin turquoise blocks, laid down for you to run smoothly across. The pipes, now white in colour, abandon the grid formation and are used for the majority of the ceilings of the rooms and sections, many of them curved. The block steps, less frequent in this act, are now part of the piping system and feature animated red yellow and orange lighting patterns on them, and turquoise posts or more white piping supports the weight in narrow corridors. 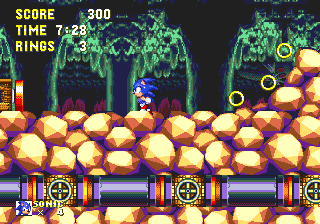 More crystals appear along the pathways, and internals tunnels are backed by flowing dark and light blue stripes of small rocks, much more prevalent than in Act 1. It's not really fair to say that act 2 is ice. It's cooled lava, out of which volcanic crystals have formed. I've alway's hated the flamethrowers in act 2 for some reason. It has its speedy moments, but Lava Reef is generally more maze-like in its structure. Act 1 is essentially a massive network of tunnels mostly cut inside the rocky ground. Though a handful of open rooms can be found in the more external cave areas, it is mostly a very enclosed level, with areas of solid ground everywhere around you. Surfaces in this first act are rocky and uneven, though paths in general are more straight than curved, plus there are steep slopes made up of a series of block steps to climb. Some areas require you to hop across a pool of lava by small stepping stones, but there are plenty of other traps to keep you busy in the tunnels too. Use large curved cuttings in the wall or spiraling pathways to throw yourself with speed across a wide open area at the bottom end. All directions are explored, sometimes leading you up or down alternating paths on the left and right, particularly in Act 2. Here, it's a similar deal, but these internal icy caves generally feel a a little bit less enclosed, with larger rooms and corridors. The curved piping on the floor and mostly ceilings encourage more speed when a spring is introduced, and there are many sections where you can be thrown upwards, only to use the ceiling curve to run right around and fall back down again (particularly annoying if there happens to be yet another spring awaiting you at the bottom). Act 2 also introduces more platform hopping across large blocks, both moving and stationary, and the slopes are smooth and gentle, with fewer steps to climb. 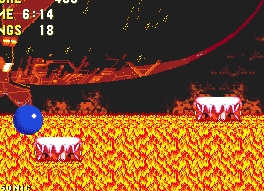 One thing that's really worth noting about Lava Reef Zone is that Sonic and Knuckles are confined to nearly completely different routes to each other in both Acts - or so it may seem at first anyway. 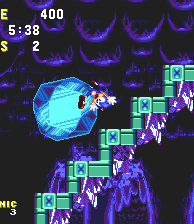 In Act 1, Sonic has the ability to explore most of the space, with his route splintering into a couple of significant choices of sub-routes towards the end, while Knuckles meanwhile appears to have a largely single-route path to himself that's literally crammed into the bottom of the stage, and takes place mostly inside the internal passages. 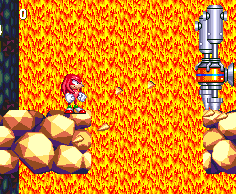 The two meet near the end and Knuckles' tasks are quite a bit more challenging here. 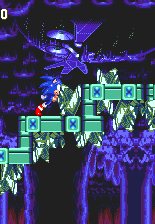 What you might not know is that Knuckles can actually access the majority of Sonic's routes too, by making use of a very well hidden stairway, described in Point #1, accessible if you can bypass the large drilling badnik near the start. Act 2 mostly keeps the characters to their own separate journeys once again, Knuckles still having to deal with some genuinely difficult sections, but at least his take on both acts are a lot shorter than Sonic's, and in Act 2, he doesn't even have a boss to fight! 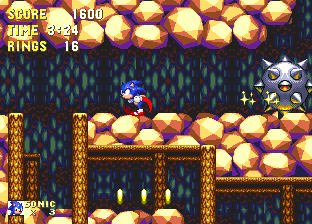 There are fewer multiple routes in Act 2, but those not afraid to explore may find one or two shortcuts if they look hard enough - a particularly big one for Sonic near the start. There are no death drops, except for below the thin walkway at the very end, in a huge open section. Still, this is a pretty difficult level for either character, though at the same time, Act 1 in particular is still a fun and lively stage to play. Act 1 has boulders and solid rock protruding from the ground all over the shop. Some crumble when you stand on them, others are breakable by a spin dash or a touch of Knuckles' fist, but some single rocks or thin lines of them remain sturdy, and can be found on floor, ceiling or as small ledges on the walls. In narrow tunnels, watch out for small sharp rocks that hang from the ceilings and drop when you stand or pass by underneath them, and press small buttons on walls or the floor to open up thin rock doorways, located nearby or opposite. When crossing lava pits, be aware that the small square stepping stones you use to hop across them move down under your weight, so if you hang around on them, you'll land in the lava, which of course, hurts you. Stand on these stones when on solid ground though and you may find a hidden spring underneath them. Usually while making your way up or down a series of wooden steps, horizontal flame shooters located along the opposite walls, or on the steps themselves, periodically shoot a small blast of fire that travels fairly slowly across the screen. Sometimes lava flows down in the immediate background, in a wide lava-fall, but other times it will drop in thinner falls in the foreground, which will harm you. These will cease for brief moments, allowing you to pass by, but be quick. Watch out for small chained spikeballs swinging 360 degrees, often on the lengthy wooden staircases or in corridors, and small green gun pods positioned outside and above closed doorways will fire projectiles diagonally down toward you in quick succession. As an alternative to a button, jump and destroy them to open the doorway in question. Mostly inside the internal tunnels, you'll find small black wheeled elevator devices, two wheels on either side, and often positioned at the top or bottom of a narrow vertical shaft. Stand in the middle and spin dash facing left to get it to move down, or right to move up the shaft. It'll keep moving for as long as you maintain your spin dash charge, but will cease soon after you release it. And then there are the crushers. These wide bronze things are possibly the meanest of all and are lined with large spikes underneath and a touch of fire to propel them upwards. They float up slowly but come down suddenly, trying to squish you into the ground or a lava pit, but their tops are flat, and make for perfect platforms to get to a higher point. Particularly nasty in narrow corridors where you only get a second or two to pass them. Massive spikeballs borrowed from Marble Garden roll back and forth quickly across the ground, cutting it up as they go. In one instance described in Point #5, one will be swinging around a large column inside a narrow tunnel, and then actually begin to chase you down a slope after you've passed it! Almost all of this is dropped for Act 2, which has its own separate range of objects to tackle. The same buttons still open doors in the same way, but flame throwers, no longer content with a short fireball now and then, now produce a flurry of fire that dances back and forth over a small area. These torches can be located on the wall, floor and ceiling this time and only pause for very brief intervals. They normally protrude from the ends of the piping system that circulates ceilings and walls. 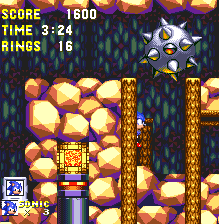 The small spikeballs are sharper but can still be found swinging 360 on chains, both above the ground and circling platforms. You can also find them swinging around vertical posts in corridors, and in this case, are safe to pass when they're behind the post and out of view. In long thin stretches, you may find a whole string of them circling the thin ledge that you need to walk along, so wait until the first one is below it, then quickly run along the ledge. The others should move down accordingly, keeping in rhythm. 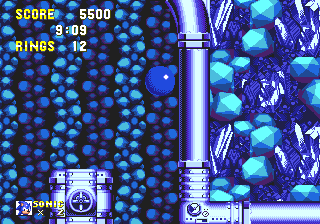 Spikeballs that sit on the ground and emit the standard "laser charge-up" sound effect are thrown up a little way into the air by the flashing metal thing underneath them, upon being fully charged. Almost a bit of an anti-climax really. Long, rotating drums stretching over a wide vertical shaft contain rows of spikes and ladder steps. Obviously you need to avoid the spikes and when you jump on the ladder, you'll grab onto it and swing around on the drum. What you need to do is jump from there to a ladder on the next one above. Do so while you're swinging upward on it rather than down, and the lower you are when you press the jump button, the higher up you should go. Pressing up at the same time may help too. The crushers are completely different in Act 2. Now they're large, square white blocks (with a valve on the front that kind of make them look like a big washing machine) and they move slowly right/left or up/down. Be careful you don't get crushed between them and a solid surface, but also use them as platforms, jumping from one to the other in an open space. Ice barriers need smashing and single collapsing platforms crumble under your weight. 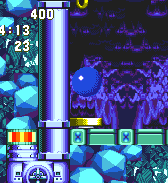 Reminiscent of a similar item in Metropolis Zone, a pair of large wheels on either end move a series of big, spike-bottomed platforms round a thin moving belt, lined vertically. 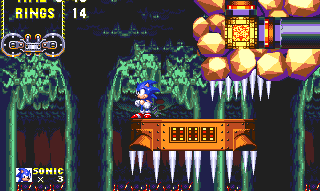 Jump on one and wait until it takes you around to the next area, avoiding the spikes on the bottom of the one above it, and of course the big pit of spikes that usually lurks below. Act 2 also has its own high speed transportation system. Step inside the entrance to a golden tunnel, and you'll be sent spinning through the winding pipe, eventually throwing you right out the other end with speed, often in a whole other area of the stage. 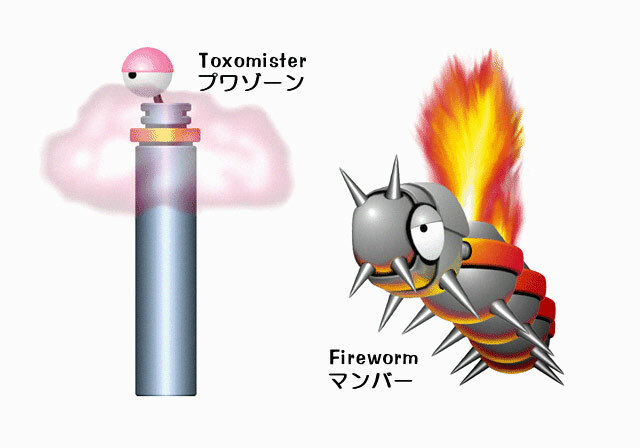 Eggman robots to encounter include Toxomister, Fireworm and an unnamed exploding badnik. Toxomister are the strange grey poles sticking out of the ground, reaching just above your character's head and with a single lazy looking eye mounted on the top, which you need to hit in order to defeat them. They can also be found upside down on the ceilings. They don't go anywhere and aren't very animated - as to be expected from a pole really - but they do produce small clouds of nasty toxic gas in their immediate area, which float down and attach to you if you make contact. Similar to the piranhas of Hydrocity, when the cloud is on you, your speed will dramatically reduce, you won't be able to jump very high, and worse, your ring count will begin to drop by one per second until it kills you. To free yourself, either kill the badnik, spin dash away, or quickly move from left to right. They're a real danger actually, not just if you're low on rings when you find yourself under the cloud, but all you need to do is take one hit from something else, and then the cloud will be able to kill you instantly. Don't think it won't! Fireworms are usually found inside the tunnels and are like flying Caterkillers, sometimes grouped in pairs. They emerge from small, well hidden black holes in the background wall, so be careful as they can take you by surprise when they first emerge. They then proceed to float back and forth, producing small flames from their wriggling spiked body parts, so hit them on the heads only please. The third badnik - "Iwamodoki" in Japanese, but unnamed in English - is a self-harming one that hides under rocks that stick out of the ground, and peaks out when you get close. At this point, you will have set them off and they begin to flash. You've got about three seconds before they explode, throwing harmful chunks of rock a fair distance around them, and you can tell that they're about to pop when their eyes open up wide. 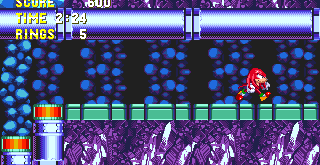 You cannot harm this badnik yourself, but if you've got a shield (and a good player usually will, in this stage), the pieces of rock will just bounce right off, causing you zero discomfort. Very useful, considering the vast number of these exploders. 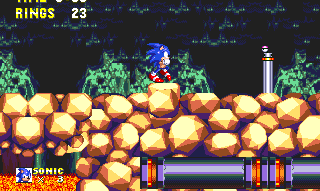 As Sonic first comes out of the internal tunnels and the background becomes visible, take a moment to step down on this square rock in the ground. Like the ones in the lava, it slowly sinks, but will reveal a hidden spring underneath it. Use this to find rings above, and an extra life to the left, guarded by a large spikeball. 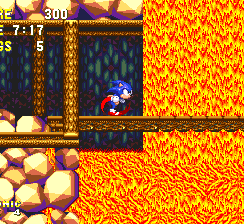 This is an enjoyable one-off structure immediately afterwards that sees Sonic spiraling around a pillar, gaining in speed as he descends, and is then thrown across a lava pit at the bottom. Brilliant when you're fast enough to match it with the excellent climax in the music. 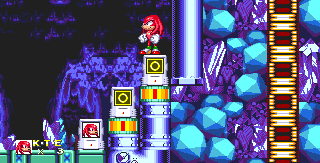 On Knuckles' route meanwhile, a 1-up can be found above and to the left of a large spiked crusher. This can be found shortly after Point #1, having fallen through the rocks broken by the driller badnik. Use the crusher to glide to a right hand platform with ten rings, then climb the wall and glide to the left. If you take the high road from Point #4, use the crusher here to look out for this wheeled elevator device on the top left of your picture. You can use this to find yet another extra life to the upper left of the area. 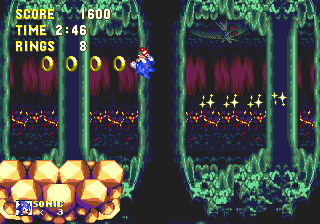 Note that this zone is the last in which Special Stage rings appear at all! If you're playing as Knuckles, there are none at all on his exclusive route along the bottom, so if you've still got one or two emeralds left, you can grab the first two rings listed below by taking Sonic's route, described in Point #1. 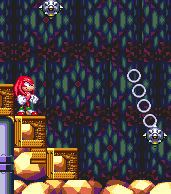 The first big ring appears just after the second encounter (Sonic's) with the driller badnik from Point #1. After that, use the wheeled elevator to climb the shaft. At the top, you should notice a flame shooter to the right. Directly opposite that is an opening in the wall that leads through to the ring. The next Special Stage ring is just after the last, on the main route. Head through the corridor on the right and at the end you should find a wide shaft with lava at the bottom and a spiked crusher moving up and down inside. Stand on the top and use it to go up. You should find an opening in the right hand wall that you can jump into when the crusher reaches its highest point. The ring is in here, and afterwards you can fall below, into another small room with ten rings. Use a hidden passage on the right to come out to the shaft again, though be careful of the crusher! The next is still not too far from the last big ring, but - as far as I can make out, at least - is only accessible with the gift of flight, so you'll need Tails for this one. From the previous big ring, carry on up the shaft, and eventually it leads out into the larger cavern. Pass the crusher and back into another corridor, and in a large-ish room, you should find some rings floating above a checkpoint and some springs on steps. 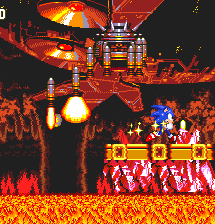 Fly up, following the rings and avoiding the flame shooter and you should find that you can fly through the ceiling, and find the Special Stage ring above. 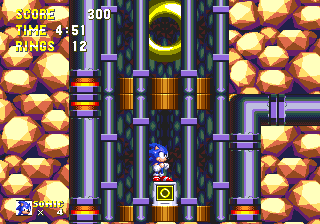 Not even Hyper Sonic can reach that third ring, though you can see it below from the room with rings above. 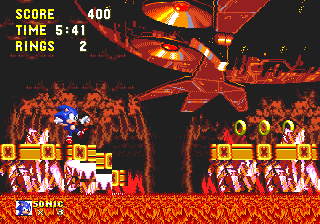 Both Sonic and Knuckles encounter this large badnik early on, in separate places. You may recognise him from Marble Garden Zone, drilling his way through the old ruins and causing earthquakes as he goes. 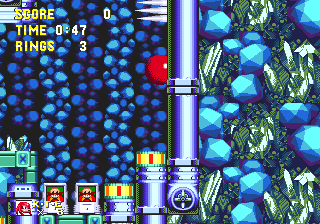 Well, Eggman appears to have had him rebuilt and upgraded with a more powerful drilling system, allowing him to bore into these subterranean rocks. Firstly, as Knuckles, you'll approach him from the left after only a brief introductory corridor into the act. He'll drill into the ground for a few seconds, during which time you can jump and attack him, but this will have absolutely no effect on anything. The ground below soon begins to give way and you'll fall into a lava lake below, landing on a rock platform that quickly collapses, so you must jump to the more stable one to the right. 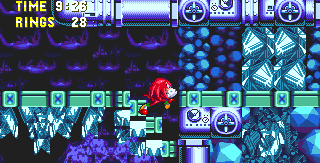 This continues along Knuckles' exclusive route along the bottom of the act, however this is a very significant point for him, because the drilling enemy actually marks a very well hidden alternate route for our red-headed friend - one that brings him straight onto the vast majority of Sonic's route instead. 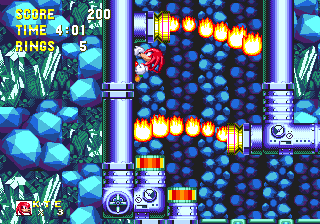 Note that this option is much longer, but a bit easier, and of course allows Knuckles access to the Special Stage rings..
To explore the rest of the act as Knuckles, you must avoid falling into the lava pit at all, and remain on the far left side when the driller breaks the rocks through. After they collapse, if you carefully look across the gap, you'll see that the driller remains on the edge. The alternate route lies behind him, but he's too tall to jump and glide over. Fortunately, according to the programming of the level, his job is done once those rocks have fallen through, so he disappears completely as soon as you've wandered far enough away from him. Just walk to the left a bit, climb back up a few of those wooden steps, and pretty much as soon as you notice that the ground has stopped shaking, you can walk back and simply jump over the gap, and he'll be gone. 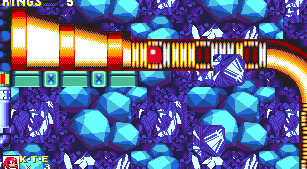 Note, however that you can't just glide right over him from the steps before he has broken the rocks, because the screen will stay focused on the driller, like a boss, so you'll just fall right into him. 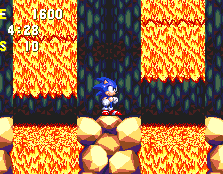 Jump up the numerous steps, dodging the fireballs and a button will open up a hidden doorway straight into Sonic's route! 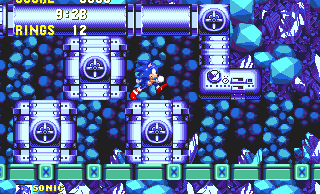 Walk through this corridor and now, as either Sonic or Knuckles, you'll encounter the driller once again! It's an almost identical situation, so you can attack him all you want, but nothing will happen, and within a few seconds, the ground to the left of him gives way. You can still stand on the far left side to avoid falling through, but this time, the driller will actually fall through with the rocks, destroying himself in the lava pit below. If you drop through, you'll land on a sturdy platform resting on the lava. If you avoided falling through, you can jump over the gap to the right for a quick extra life! 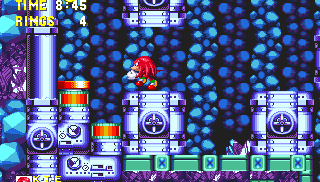 By the way, Knuckles CAN jump over the drill. A good well timed spindash and immediate jump should do it every time. THANK YOU! :) This was something I didn't know about before this. You are right. It's extremely valuable given how difficult it is to get Giant Rings with Knuckles. 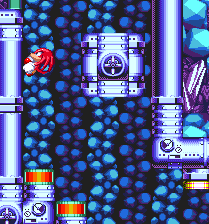 Here's a nasty little bit for Knuckles, along his exclusive route. You need to press a switch on the side of a step to the left, and then head right through the door that opens up. The catch, of course, is that a crusher is forever rising and falling into the space between, taking about five seconds to rise, and allowing you to move around underneath it before it comes back down again and makes some echidna pizza. It sounds daunting and, granted, it's no picnic, but as long as you don't dordle you should be able to do it in good time. Use the spin dash perhaps, or if you feel really intimidated, do the task in two phases. 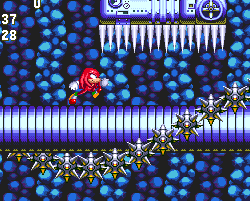 On this upward slope for Knuckles' exclusive route, these spike sets can be a real bother, especially with the low ceiling and Toxomisters. My advice: try and approach each spike set with a little speed, and then jump and glide over them. If you jump from right in front of one, you'll probably land smack bang on its business end. The main route is all quite self explanatory, and with no real option for multiple routes until roughly two thirds of the way through. 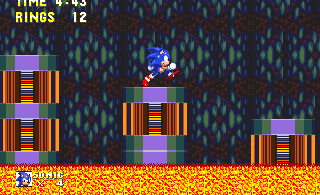 This diverging point occurs just after a wooden bridge over a lava pit, (the only one of its kind in this level, and similar to the type found in Green Hill or Emerald Hill). It leads from an internal corridor into an external area with a red horizontal spring below some wooden steps. There's a curve in the rocks to the right, and you can either use the spring to hit the curve with speed and go flying up into the air and land beyond a rolling spikeball for the higher route, or you can take the corridor that cuts into the ground right next to the curve, for the lower. Both remain separate almost until the end, and neither holds a particular advantage over the other, however the lower option has a couple of interesting features, discussed in the next point. It also splinters into a couple of sub-routes at the end. If you took the lower route from Point #4, you'll be flung across a lava lake and toward another tunnel. In here, you'll find a curious one-off use of one of the large spikeballs. It's swinging around a thick post, so it's harmful when in front of the post, but not when it's behind. As soon as you step past it, confident that you've passed the large obstacle, it suddenly breaks free and begins rolling down the tunnel after you! One of the earliest examples of the now frequent cliche of having Sonic chased by something large. Leg it until you come to the first of two gaps in the floor, at the bottom of the slope. Drop in the FIRST one, NOT the second. The spikeball will go right over the first gap, and the wall will force it to drop into the second instead. 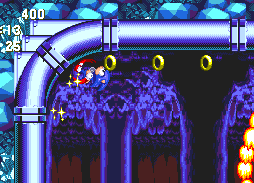 You'll be able to see an extra life at the bottom of the second gap, and if you want, you can jump out and get it, but be aware that when you've dropped down through that second gap, the ledge will be too high for Sonic to jump back up to (without a lightning shield that is, and of course Knuckles can simply climb out), and you'll be stuck on this left side. That's not good news at all, as this area has a spring that places you back onto a path much earlier on in the level - just after the second driller segment in Point #1 in fact, and you'll have to do everything after that all over again! What a chase! I won't dare do this act.. If you jump into the pit with the extra life, quickly press the jump button as you land on the life and you should have enough bounce to get back up! Continue right after that slightly terrifying chase sequence, and following a number of different obstacles, you'll reach this curious area where a number of one-off purple and orange cylindrical platforms of varying heights are arranged across a lava pit. 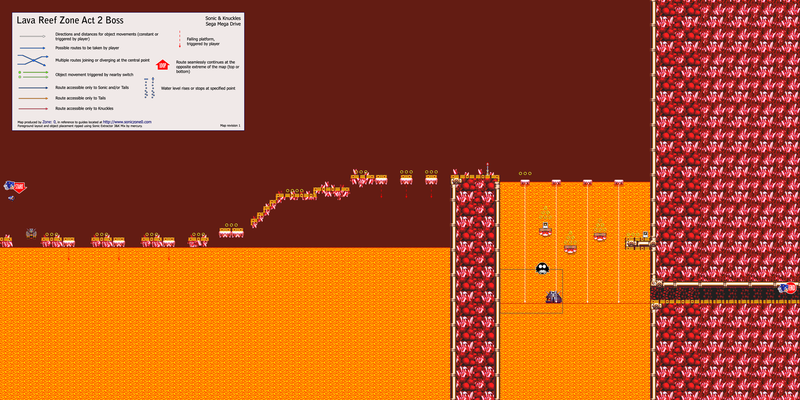 This is the only part in the whole level, however, where the lava rises and falls, and it'll rise all the way up past the tops of these platforms to engulf them entirely, much like similar sections back in Hill Top Zone. Stand on the ledge on the left until the lava begins to drop down again, and then carefully make your way across the platforms. Half way through, it'll begin to rise again, so continue across the increasingly taller platforms to stay ahead of this tidal lava. At the end, you'll have a choice of taking one of two different brief sub-routes, either by carrying on to the right, or using the black wheel device just above - both joining with different points of the upper route of this act, toward its end. Holy cow - I've never seen this part in all my years of playing this game. Amazing. The boss battle of Act 1 takes place on a straight stretch of rock, beyond a wide lavafall that covers the entire background. There are two alternating phases to the boss and three separate things can be destroyed, but in order to move on to Act 2, you only have to defeat the giant hand, which attacks in the second phase, and both characters fight this boss in the same way. In phase one, large black orbs with long, snaking bodies of smaller black orbs attached to them will rise up from in front of the ground, one on each side of the screen. 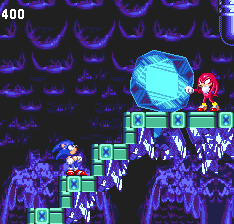 Jump and hit the large orb on one of them while they're coming up, but once they've reached the two top corners only Sonic can hit them, using the insta-shield, while Knuckles can't jump high enough. When they're at the top, one of them will spurt down three small yellow projectiles across the floor, and then the other orb will do the same. The safest place to stand is always directly underneath the one that's firing, so align yourself accordingly. If you stay in that position instead of moving across to the other when it starts firing, you should be able to just jump over the projectile that then comes your way, from the opposite orb. As normal, the projectiles will just bounce off of any shield you have. When they've finished, they'll move back down, giving you another opportunity to hit one of them. The orbs can be taken out with four hits each, but whether you destroy them or not makes no difference to the completion of this boss, as it's the giant hand in the second phase that counts. If you do defeat both of them (which might be convenient anyway, just to get them off of your back and speed things along a bit) the second phase will just repeat. 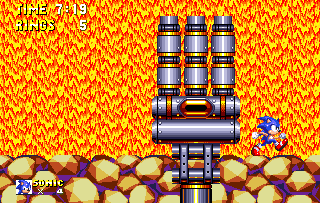 In this second part, the large, open mechanical hand (interestingly similar to that of Eggman's giant mech at the end of this game) will rise up in the foreground and follow your movements for about five seconds before it pauses. It remains still for about a second, and then comes crashing down onto the ground, hoping to catch you underneath. This won't kill you instantly like a regular crusher, but will obviously cause damage. After dodging this, what you need to do is jump and hit the top of the hand when it's on the ground. It's not there for very long, but you should be able to get two hits in at a time if you jump just at the right moment while the hand is directly over you, so that you dodge its attack in the air and then simply bounce off it a couple of times. You need six hits on this machine only to defeat this whole boss. After that, everything goes all dark and quiet as the lava cools very quickly. Proceed right, to the icy caverns of Act 2.. The hand DOES crush and kill Tails instantly, even when he's Super. The reason could be Tails' smaller height/sprite size. 'Heat Arms' is the name of this arm-like sub-boss. 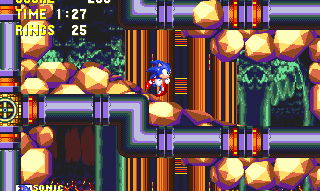 When Sonic's route makes its rare dips into the outer caves, the more open structure brings with it these platforms that feature spikeballs circling around them. Obviously, timing is important here. 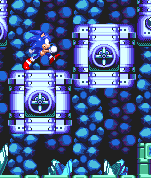 Here's a tricky collection of moving blocks for Sonic, the top one moving into the wall, while the bottom two move together in the opposite direction. You need to stand on the lower right block as it moves to the left, and drop through the gap at the end before the top block crushes your face into the wall! Knuckles' last stab at claiming an emerald. To find it, take his route until you get to the wheeled chain of four spiked platforms, above a pit of spikes. It's just after the first checkpoint, in a large room. The entrance to the hidden corridor that houses the ring is just on the left wall here. 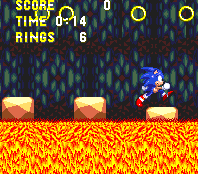 For Sonic, his first big ring of this act is on the main route from Point #7 (i.e, don't take the shortcut to the left, carry on to the right hand ledge from the platforms). As you wind through corridors, you'll soon come to a much taller room, accessible by a red spring in the corner. Above, there's a ceiling that has a series of spikeballs circling it, which actually belongs to the other route, but can still hurt you here if you spring into it at the wrong point. There's a block moving left and right in the center of the room though. Land on this, and then jump into the ring room's entrance on the left wall. The next can be found still on Sonic's main route. From the last big ring, drop down and carry on the path. Soon you'll come to a very tall circuit of platforms moving around a wheeled chain, ascending up through a tall room. Reach the top, and the room can again be found on the left hand wall, but it's quite high up, so you'll probably need to jump when your platform is at its highest possible point. Quite a well hidden one, this. 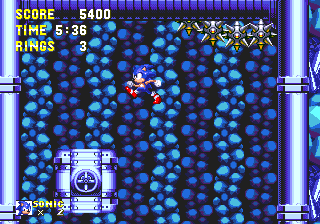 Both of Sonic's alternate routes at the first part of this act converge at a second, shorter circuit of chained platforms. At the top right hand corridor here, continue through and there will be a couple of long rotating drums with ladders on them that you must use to fling yourself up through the floor to the next room high above. While on the ladder, it's best to jump while swinging upwards from as low on the drum as you can. In the next room, there are two moving blocks in the middle it. Use the yellow spring to reach them, and from the right hand one, you can gain access to to the ring by jumping into the wall. 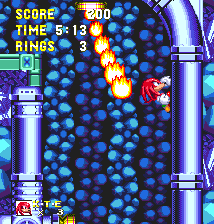 The final Special Stage ring of the game actually has two alternate entrances, and again leads on from the previous one. You'll soon arrive at a long dark curved cutting in the wall that Sonic automatically runs down. He's flung through the air. The first entrance can be found in the ground below where he lands. Just walk down the steps to the left and drop in through the wall to the right. The ring room inside has a button which opens up a door at the end of the right hand corridor leading out. This can also be used as an entrance however, as there's button for it on the outside as well. This second entrance can be found by continuing through the corridors. The door isn't visible, so the effect of the button isn't immediately apparent. 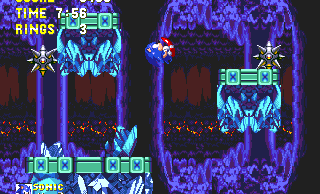 Not far into the wildly contrasting ice caves of Act 2, and Sonic and Knuckles begin their separate routes when it comes to a batch of large moving blocks leading upwards. 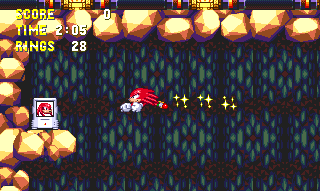 Sonic can hop along these as normal, but unfortunately for poor ol' Knux, they're just out of his jumping range. 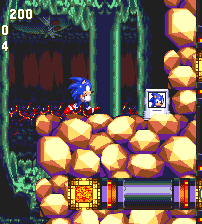 Instead, he needs to go over to the bottom right corner of this room, near two Eggman boxes. 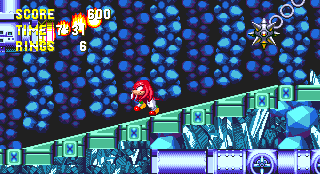 In the wall, between an exploding badnik and some spikes above, jump into a hidden breakable barrier that only Knuckles can knock down, where you'll be taken through a transportation tube to the next section. 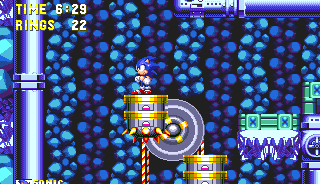 As Sonic meanwhile, take the platforms to the high ledge on the right. 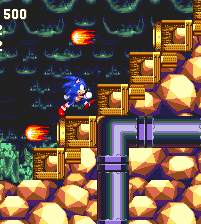 At the top, your usual route is right, but if you look left, you'll notice another platform, accessible by remaining on the highest block as it moves to the left. You can also follow this route and use the moving platforms around this area to find a couple of large rotating ladder drums above. Use them to ascend the wide, tall shaft and you'll begin a pretty big shortcut that cuts out a decent chunk of the whole route. Win! 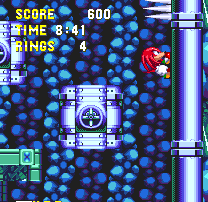 Knuckles can actually get up to Sonic's route here, and thereby collect the extra giant rings on that route as well, but it's pretty tough and requires taking advantage of peculiar properties of both glide physics and hitstun. When you first break into a glide, your vertical position will immediately drop by 2 pixels, and if that drops you onto an object you can hit and bounce off of, the reaction will take those 2 pixels into account, giving you a significant boost in your vertical velocity for that frame, and causing you to shoot up in your glide to a much higher position than you reached at the apex of the jump. This is a large enough boost to easily get onto those platforms. The problem, of course, is that the only objects around here you can glide-bounce off of are the two Eggman monitors, and if you try to bounce off those then you take a hit and get knocked out of glide animation. ...That is, assuming you actually take the hit. What you really want is a way to avoid letting it hit you, and without invincibility boxes (nor enough rings to get to 50 and go Super) that early in the level, only one method remains: you have to bounce of the monitor after you've just been hit by something else, because any would-be hits coming less than 2 seconds after the last one are silently dropped with no consequence. You'll bounce off the monitor, not take the hit, and continue gliding up. The obvious way to invoke is to break one monitor normally, then quickly bounce off the other. 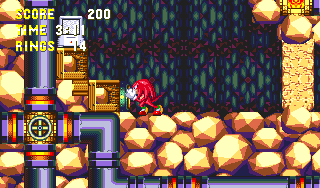 There's yet another, even more obscure way to do it, though: break the rocks and start going into Knuckles' route, but not far enough to go into the warp tube. From the edge of that pathway, jump into the RIGHT side of the spikes, which barely protrude down over the entrance. You can take a hit from this, and recover quickly enough to go left to the monitors and bounce off one. The nice thing about this way is it lets you have two tries at it instead of one (provided you had a shield, or can get a ring back for the second try). Have you ever done this, or are you just theorising? If so, please tell us if Knux pushes himself down the stairwell. 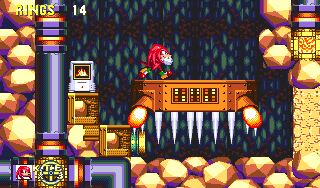 The only way Knux can get high enough is going to be hitting something in mid-glide to knock him up onto a floating fridge & there is nothing in here to hit at that level-the caterkiller is in the room before & the Robotnik boxes are much too low. Now this is a really nasty bit, for Knuckles only. After wandering through trap laden corridors, another transport tube system will drop you off at the bottom of this vertical passage. You have to climb your way up alternating sides of the walls, past three fire torches either side. Naturally, this is a piece of cake with a fire shield but without one, the frequency and range of the torches make them very tricky to get past in one piece - You're going to have to be extremely quick and careful. At each one, wait until the torch stops then climb onto the opposite wall, and try to jump off back over to the top of the torch, where it's safe to stand. Hopefully, you'll be able to do this before the torch starts up again, and bear in mind that they give you very little time between flames. Try to recognise their pattern and make your move when the fire is flailing upwards, if you know it's about to stop. After that, there's another single torch at the bottom of another vertical passage. Climb up the left wall there, but beware of another torch on the ceiling. There's a third passage above, but it only contains a large moving block that goes back and forth along the gap, so watch you don't get crushed while climbing up. Beware of a final torch at the top on the right, and use the block to touch the button just underneath it, to open up the doorway above. After all that, as if rubbing it in deliberately, there's a fire shield over on the far left. Handy. 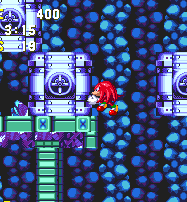 Near the end, Knuckles confronts a final tricky patch, found in a large room containing four rows worth of blocks, moving in opposing directions, and you must use a combination of wall climbing and platform jumping to make your way through them to the top. There are two on the bottom row, and one on each of the top three rows, but they're not necessarily quite as tricky to pass as they may seem. From the bottom, hop up the couple of steps and climb the right wall when the block above you begins to move away from it. Please do so without getting crushed by it! Climb up so that you're level with the second row block (which doesn't go all the way to the wall, so you'll be fine there) and when you get a chance, jump off into the gap between the two blocks on the first row. When you land, keep holding left to ensure that the block doesn't push you off the ledge. When they move left, jump up over the left block and you'll find a vertical spring on the far side of the room. Use it to go right up along the ceiling, straight to the ledge above, without even having to deal with the top two rows. Make sure you don't hold right while doing so though, otherwise you won't make it. There are several ways of beating this section, but that's probably the easiest. If you're feeling daring, you could try hopping up each of the blocks by jumping just before you get pushed off by the one on the next row. 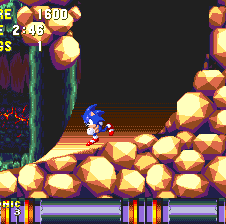 After the final checkpoint, Sonic steps out into the open cavern to begin wrapping up the act. 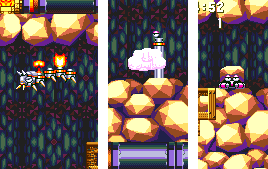 Platforms (collapsing ones, moving ones and even ones with deadly spikeballs swinging around them) wind their way up to a thin, crystal staircase toward the Death Egg. 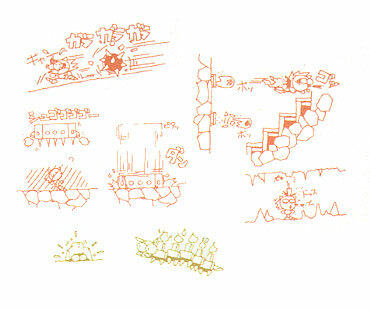 As you make your way past the first platforms, a ledge leads to the left, past some flame torches to a yellow vertical spring against the wall. 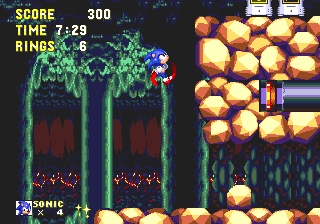 In 2D Sonic in general, there's a kind of unwritten technique when it comes to running along curved walls and ceilings that you just sort of learn without realising, but this is one of those cases where I worry that a complete newbie may feel like they're missing something, so I'm going to elaborate. The spring takes you up along the wall where a curve forces you to run along the ceiling. A long moving platform slides along up here, and the idea is that you keep running along the ceiling until level with it and can just drop down. The logical thing to do here would be to hold right to try and maintain grip, after all, you're running to the right, but if you do that as you hit the curve, you won't get far at all. You either need to not touch the D-pad at all after the spring, or, oddly, hold left. This will keep you running, though obviously still best used when the platform is nearer to you. You might have to jump off in order to land on it, and steady yourself with the left button to avoid falling off. 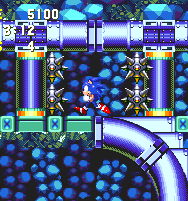 The technique is worth bearing in mind in pretty much all 2D Sonic games however - when running along a path that loops from the floor to the ceiling and ends up heading in the opposite direction, it's always better to keep the original direction held and not switch accordingly - you'll still keep your momentum going. Continue along the platforms. If you fall through the initial pair of collapsing ones here, you may land on some steps just below. Rather than dropping into the lava to the left to retrace your steps, an alternative, very well hidden option is to climb the steps and then take a long drop off the right. There's a massive gaping pit of death here - have I gone mad? No. as you fall, as long as you stay very close to the wall, you'll land on a platform down here, which leads back into a tunnel, safely through the lava falls above. 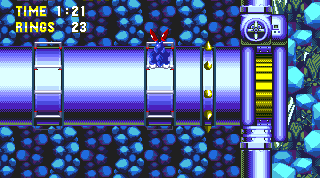 There are a vast amount of small exploding badniks here, but just keep going and you'll eventually come to a transportation tube (Sonic's only meeting with one) that delivers you straight upwards and back onto the stairway from where you fell. Not much benefit, but one of those rare little hidden things that can be missed even after dozens of play-throughs of this level. 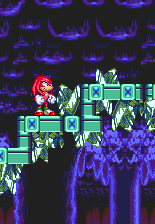 The huge bottomless pit actually leads down to the doss when Knux drops his boulder. 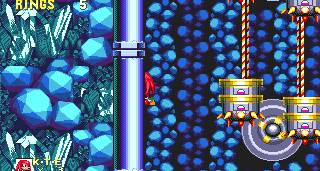 Oddly enough, when you're playing as Tails, in S3&K, when Knuckles drops his boulder, Tails uses entirely the wrong sprite. 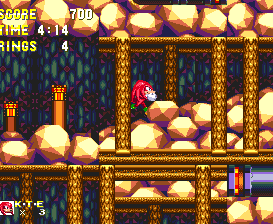 Playing as Knuckles himself sees you entering the final open cave section from the very top, above the stairway that Sonic takes (though at this point you can freely wander down it and have a look around if you want). A series of rings will hint to you to glide across though, right above the upper steps and through the doorway at the top of them. There's a collapsing platform in the path, just before it leads into an internal section, and you can actually drop down this to a hidden area below - worth doing for twenty rings (which, actually come to think of it are very unnecessary at this point) and an extra life (which isn't). A transport tube below will take you back up, though don't be tempted by the collapsing platforms on the left here - unlike the one above, they lead to the bottomless pit below, so you'll lose that life that you just acquired. 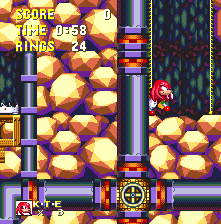 Both routes lead through a corridor where Knuckles simply walks out of the level, ending it abruptly without fanfare, score tallies or even a boss! Clearly, this is his territory, and there's no stopping him! As hyper tails you can fly to the 20 rings, and extra life. You don't have to have Super Tails. As said above, you can carefully fly over the bottomless pit (I wouldn't really classify it as a bottomless pit, it leads down to the boss) to the rings and life, then you can fly up to the staircase. Knuckles isn't there with his boulder yet, so you'll have to backtrack a little. If you playing Sonic with Tails, then Tails cant fly on this place. He can jumping, but cant fly. This is protect Knuckles way? 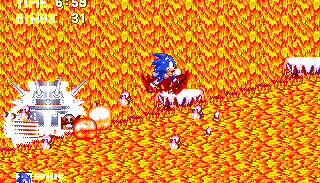 Sonic continues to fall down to the molten lava below, and now the Death Egg is looking bigger than ever. 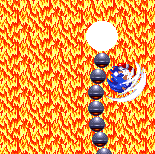 Eggman's huge mug on it takes up most of the background but at the bottom, Sonic will land safely on an Act 2 stretch of road, lying just above the lava. This is only temporary though, as the eyes of the Death Egg suddenly light up and torch the whole area, changing the sparkling blue crystals and background to scorching red. Not least of all, a massive chunk in the middle of your platform has crumbled, leaving Sonic literally teetering on the edge. Move him to the left to safety and then jump over the lava pit to the platform that remains on the right and grab the rings. 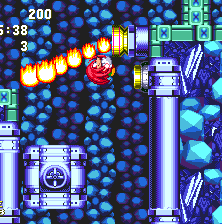 You'll notice Eggman appears in the background, concealed inside a heavily spiked floating machine. For your first challenge, he launches 8 missiles at you from his safe position. The following segments are tough, and require the most absolutely precise platform hopping skills you can master. Don't stop, but also don't go too fast, or you'll mess up. You basically have to head right from here, jumping from platform to platform, but the catch is that the screen scrolls at a set rate. If you go too fast and are constantly hugging up against the right side of the screen, you won't know where to jump and land so try your best to stay in the middle. Don't lag behind either, as each missile will come down on a platform, and if you're not quick enough, you'll get hit so keep moving all the time. You can tell when one is coming down when you see the target markers over the top of the platform, and also beware that some platforms crumble under your weight. Eventually, the missiles will stop and your path will begin to head upward, with the screen still scrolling. Here, if you fall off anywhere, you'll die instantly at the bottom of the screen. Keep moving up the steps, then along the crumbling platforms, being extremely careful not to slip off. This may take a fair amount of practise. At the end, you'll be relieved to see a checkpoint, and then some smaller pink rocks appearing along a wide lavafall. The screen continues to scroll, and you need to jump across four of these pink platforms as they come over from the top of the fall and begin to descend down it. If you slip and fall, you'll die. These take you right and when you land on the fourth one, stop to a halt and the screen will finally stop moving and you have free control once again. I know, it's strange that you can now wander around down below the platforms now, whereas a few seconds ago you would have died just trying to drop down here, but it's all part of the challenge I suppose. You can now go downwards where you'll find an arrangement of platforms containing rings and power-ups. I would strongly recommend going to the far left one where there is a fire shield for you, which makes the rest of this experience much easier. Stand on one of the pink platforms that are moving downwards next to it, and this will take you to the bottom, for the next phase - the actual boss bit.. The final phase is where you get to have your say in the battle, but not in the standard way. This is one of those bosses where you can't hit him yourself, but he is instead defeated by his own stupidity. All you have to do is survive for that length of time and it's not really any harder than what you've just done, especially if you hold onto that fire shield. Take the pink block all the way down to the bottom pool of lava, where it'll land just to the left of the middle. 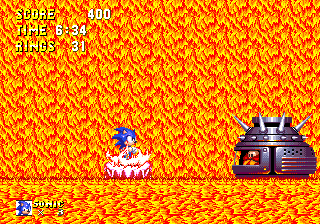 This gives Eggman amble room to pop up from underneath on the right, in his new 100% lava-and-hedgehog-proof machine, armed to the teeth with spikes. 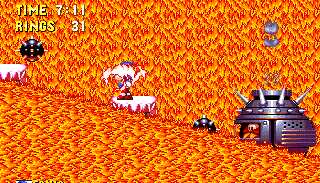 The lava pool will immediately tilt down to the right, causing the pink platform you're standing on to start sliding down towards Eggman. When you see another one coming down from the top, immediately jump off onto it to stay well away from him, and keep doing this as more and more platforms start sliding down. 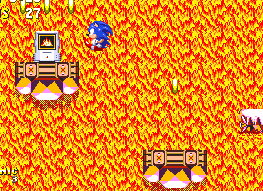 With the fire shield you can happily run along the lava, however Eggman has a plan to counter this. He will begin to shoot large spikeballs from the top funnel of his machine which fire upwards and then land either between two of the platforms or just near the edge of one of them. For this reason, it's best to try and keep to the middles of the platforms and you should be ok. Apparently even a genius with an IQ of 300 can make mistakes, because as it turns out, those spikeballs are the only thing that will cause damage to the doctor when they slide down and collide with him at the bottom. 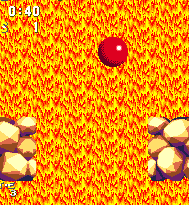 After a while, the lava will fall back to being straight again and Robotnik will dip back under. Stay on the middle block because he's about to come up on the left side and repeat the whole process in mirrored form, tipping the lava slope to the left now. He'll continue to switch between the two sides at regular intervals, and should get hit by 3 spikeballs on each round. It'll take 14 of them to beat him though, a lot more than the standard 8 hits needed for a regular boss. 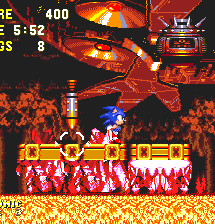 At the beginning of the Boss section, when you're falling, you're in control of Sonic. If you press right and land on the platform with rings and grab one, you'll be given an extra life, no matter how many rings you're carrying. I guess this was done to somewhat compensate for the boss chase. Not true - it's a bug, and it does depend on how many rings you have. The Lava Reef boss fight technically takes place in its own level, so all of the flags and counters that are reset when you enter a new level are done so here, including the one which counts how many extra lives you've earned from rings so far. So, when you collect a ring, and you have 168, the game says, "168 is more than 100, and he hasn't gotten an extra life yet this level - better give him one." Lava Reef Boss is called the 'Hot Machine'. 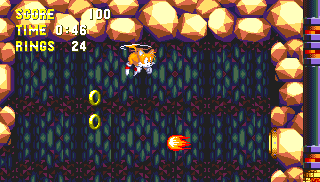 Interesting fact: When playing as Tails in S3&K, you still have to do this boss. - There's a strong theory regarding the part Knuckles plays during his playable story through Sonic 3/Sonic & Knuckles. 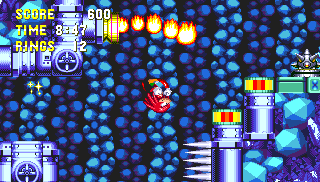 There's reasonable evidence, particularly in this level and the following one, that suggests his story actually takes place completely after Sonic's has finished, constraining it simply to a "clean-up" operation across the island in which the aim is to defeat the remaining badniks, including one particularly resilient and confident Eggrobo. 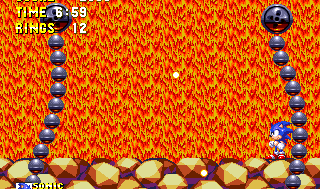 At the end of Act 2, Sonic clearly approaches the Death Egg, as it peers through the open volcano in the ceiling, yet it's no longer there when Knuckles comes to the exact same spot - presumably having already been launched. The same can be said for its appearance in the upper background of the next level, Hidden Palace, where the light coming through highlights it even more clearly. 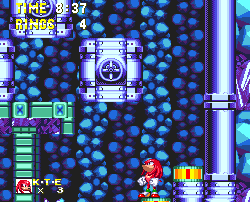 In Act 1, Knuckles' exclusive route is contained almost entirely within internal sections where the background (which also normally contains the Death Egg) can't be seen. However the theory stumbles slightly if you take the very secret alternate route described in Point #1 which redirects Knuckles onto the vast majority of Sonic's route. Vexingly, by Point #4 as Knuckles, you will then see the Death Egg in the background, with a method that's perfectly above board. Nothing has ever been officially clarified, but nevertheless, I would say there is enough other evidence throughout the game to suggest this theory to be true, and that perhaps this was an oversight on the part of the developers. 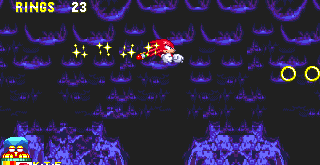 Also in HPZ the death egg is missing from the background as knux. 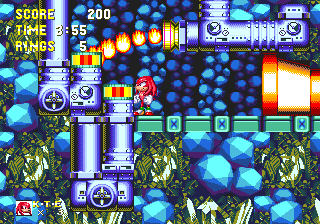 Launch Base act 1 is the same too; also, in Angel Island 1, you can only see sky and clouds in the background as Knuckles, since the island is floating - the sea and horizon you can see as Sonic is gone. 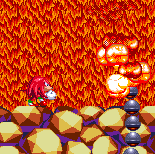 This also explains the reduced water levels in most of the Sonic 3 zones as Knuckles. There's loads of evidenc elittered across the entirety of S3K that Knuckles' part comes after Sonic and Tails. The lack of a skyline in Angel Island is one. The building destroyed in Launch Base. The lack of water in Carnival Night. The lack of Death Egg in Launch Base or Lava Reef. The ghosts already released in Sandopolis... Not to mention the fact Knuckles is spending the entire playthrough fighting Robotnik's robots (Or what's left of them.) which would make no sense story-wise before or during Sonic and Tails' events. 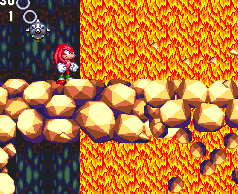 Final piece of evidence is that the Island is in the air during Knuckles' game, but is surface-bound for S&T, due likely to the Death Egg's landing on the island. The other thing is the fact it's NOT Robotnik himself Knuckles is up against but an EggRobo. If it were any other place in the timeline it'd be Robotnik himself.